Many people don't use their electric knife on a daily basis, they save it for special occasions. This means they are using it as more of an electric carving knife than as a normal, everyday knife. There are some things in particular to look for when looking specifically for an electric carving knife in addition to the normal electric knife buying considerations. 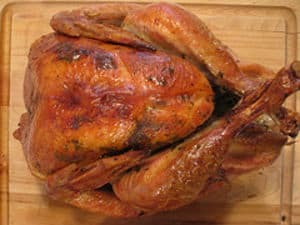 Your electric carving knife should have a long enough blade to easily slice through all roasted meats and cooked turkeys. Normally a 10 inch blade is more than enough to get through any normal meats and many electric knives will do just fine. The Oster Inspire Electric Knife comes with a 11" blade which is the tops we've seen. A few electric carving knives actually come with a specific carving blade. This can be very nice if you're specifically going to use your knife for carving. The Cuisinart CEK-40 Electric Knife is one of the ones that comes with a specific blade for carving. One of the things to consider when buying an electric carving knife is whether or not you prefer to carve at the table or in the kitchen. If you carve in the kitchen then there is nothing to worry about, however, if you want to carve at the table you need to look at a few options. For more details you can read our discussion of cordless electric kitchen knives but the summary is that cordless electric carving knives are not durable, have very little power, and have short battery lives. However, if you really need to go with a cordless electric carving knife and you are only using it for carving, we would suggest the Ginsu Freedom Carver Cordless / Rechargeable Carving Knife . It was the only one with enough power to make it through meats and roasts, however, the battery is very short lived so make sure you put it to use right away before it dies. It might not be the upscale or formal thing to do but we recommend getting a nice, long extension cord and use it to allow your electric carving knife to easily reach the table. The Cuisinart electric carving knife comes with the extra carving blade and is known to be durable and powerful enough to carve most meats and roasts. The Oster electric carving knife has the extra long 11" blade which should make carving much easier if you normally have larger meats or turkeys. The Oster also comes with a carving fork.